With so many heavy duty trucks spending the majority of their time on the highway, AC power sources to operate battery maintenance systems aren't always practical or available. In addition, vehicles and equipment sitting unused for extended periods of time often experience extreme battery drain resulting in dead or ineffective batteries. Not only does poor battery maintenance lead to unnecessary battery replacement costs, but it can also lead to expensive emergency jump starts or tows. Downtime leads to money and opportunity lost and premature battery replacements are a costly expense to the budget. The SP-10 eliminates these problems by combining PulseTech's patented, high frequency Pulse Technology with microprocessor controlled intelligent charging algorithms to charge, condition and maintain vehicle and equipment batteries, extend battery performance and useful life by three times. As a battery ages through use or sits unused for periods of time, lead sulfate crystals enlarge and build-up excessively to the point where they create a physical barrier across the surface of the battery plates. Before long, this build-up can become so dense that a battery is no longer able to accept or release energy – effectively killing the battery. In fact, 80% of batteries worldwide are discarded due to battery sulfation. PulseTech's patented Pulse Technology solves the sulfation problem. It desulfates the battery plates and returns the battery to a like-new state capable of holding a full charge. Pulse Technology has been proven to extend battery life by three times. 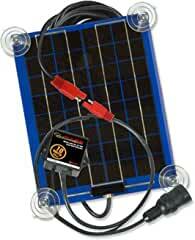 The SP-10 works with all types of 12-Volt batteries, including conventional flooded, gel, AGM and VRLA. It utilizes greater efficiency, higher quality monocrystalline cells that pack more power per square inch than standard amorphous "thin film" solar cell panels. It is protected with a clear, polyurethane plastic coating mounted on a laminated aluminum making it virtually indestructible and impervious to weather, aging and damage from everyday knocks and bumps. Weatherproof and with multiple mounting options, the panel dimensions are 12.41" L x 9.85" W x 0.2" H. When mounted on a vehicle or equipment, the SP-10 is an entirely automatic battery conditioning and charge/maintenance system. The SP-10 comes with a five-year limited warranty.